Leading UK plastic piping manufacturer Polypipe has helped three rare Asian bears to discover the joy of play and exercise their grey matter in their new UK home. 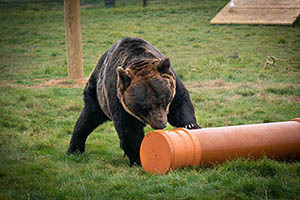 The Doncaster-based firm, part of the FTSE 250-listed Polypipe Group, donated plastic toys and puzzle feeders to the trio of Ussuri brown bears, which arrived at Yorkshire Wildlife Park (YWP) in August. Upon discovering that the animals were being relocated from their native Japan to the animal sanctuary in Branton, Doncaster, Polypipe worked with the wildlife park to design a variety of bespoke toys that have since become a hit with brothers Kai and Riku, and 27-year-old female Hanako, following their 5,400-mile journey from the Far East. The Ussuri brown bear is on the International Union for Conservation of Nature (IUCN) Red List of Threatened Species due to habitat loss and illegal hunting, with numbers dropping to around 10,000 in Japan. The bears, also known as the Black Grizzly, can weigh up to 550kg and live up to 35 years.